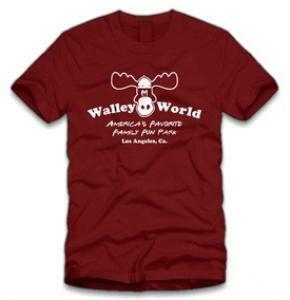 In the classic movie National Lampoon’s Vacation main charater Clark Griswold (Chevy Chase) and his family travel across the country to a theme park called Walley World, now you can have your very own Walley World t-shirt. This is a t-shirt that features the mythical american theme park logo a moose with a hat on and underneath the moose find the saying “America’s favorite family fun park Los Angeles Ca.”. Made from 100% cotton you can get this shirt in men’s and women’s sizes Small to 3XLarge also check out the wide variety of colors to choose from. Get your National Lampoons Vacation Walley World T-Shirt.